Originally posted on Zing Magazine‘s website, August 2006. While some artists seek precision and control with their work, Joseph Nechvatal unleashes a virus on his computer-based imagery—part of his philosophical approach to making art. His work embodies both biological and technological elements, drawing metaphors between the two. While his production utilizes a set of rules similar to those of the Abstract Expressionists (whose aesthetics are built upon a collection of defined parameters, and more concerned with process), Nechvatal deviates by allowing the computer virus influence the outcome of the image. At times beautiful and others disconcerting, his work challenges the viewer to go beyond the surface. Nechvatal received his PhD in the Philosophy of Art at the Centre for Advanced Inquiry in the Interactive Arts, The University of Wales in 1999. However, since 1986 he has incorporated the use of computers and computer-robotics into his work. AndrOpathOlOgynite cOntagio (2003) is a beautiful and colorful diptych. Yet upon closer examination, the beautiful work becomes disturbing. On the upper part of the canvas are two large egg-like objects. On the bottom half a multilayered collage of imagery includes what appears to be a woman’s mid-area from the bottom of her rib cage to the top of her pelvic region with the tips of her knees slightly exposed. 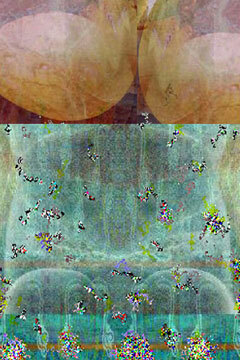 On top of this base image are translucent and repeated medical drawings of the female reproductive system. Nevertheless, the elements look as though viral organisms are eating away at the imagery—consuming or ingesting the woman’s reproductive biological matter—connotating cancer or some other disease. Nechvatal’s work offers much more than simply drawing a parallel between a computer and biological virus. His work is the sign of the times. We live in a time of AIDS, cancer, war, and computer viruses that are invading our cultural and biological sanctity. Nechtaval’s body of work abstractly and philosophically addresses these issues as we search for a remedy. SETH THOMPSON is an educator, media artist, and writer based in the United Arab Emirates. 1. Author email interview with Joseph Nechvatal, April 2006. 3. Author email interview with Joseph Nechvatal, April 2006.